Do you think that an elopement might be right for you? Maybe you were planning a big wedding, and now seating charts and vendor lists are stressing you out and you’re wondering if its even worth it? Or maybe you’re overwhelmed with all of the opinions from everyone and feeling lost? Girl, an elopement might be just what you need! Before you freak out, know that an elopement isn’t just “running away” to get married alone. It CAN be. But it can also include your closest family and friends AND as many wedding traditions as you might want. 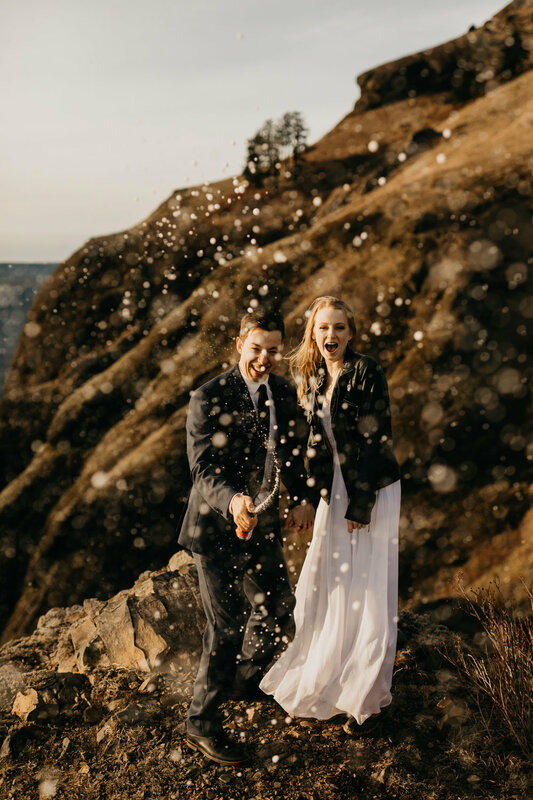 An elopement is exactly what you want it to be, but most importantly, it is breaking down a wedding to what really matters. Its getting rid of all of the fluff and the expectations, and its focusing your wedding on what it should be focused on: Two people getting married. And that can happen at a courthouse, at YOUR house, on a mountain, in another country, ANYWHERE that you want. You can have 0 guests or you can have some close friends and family. 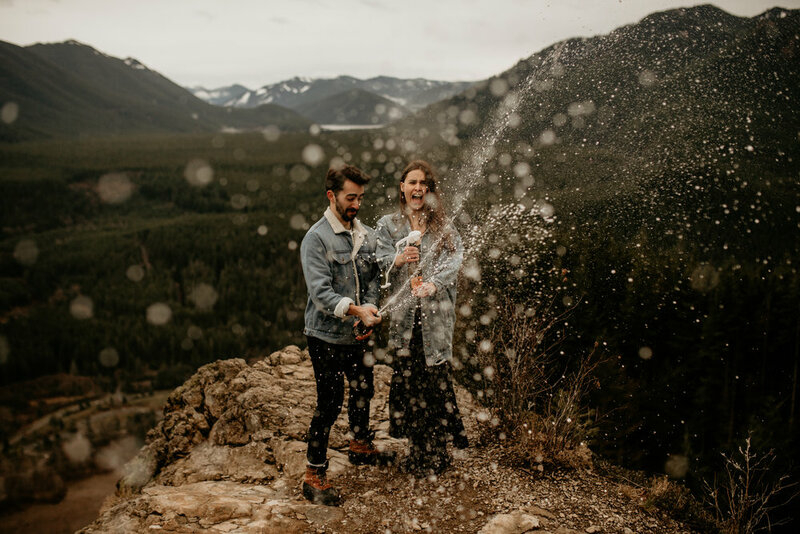 If that sounds like what you want, here are a few tips to ensure that you can have the best elopement possible! Plan the day that YOU two want. Don’t feel pressure to include anyONE or anyTHING in YOUR special day. If something is going to add stress to your day, don’t do it. If saying your vows in front of your guests is going to stress you out, don’t do it. Do it alone with just the two of you if you don’t want to include your guests in that private moment. If wearing a white dress doesn’t feel like you, don’t do it. Wear a black one. Or whatever color you want!! Or ditch the dress if that’s not you! Basically, just plan the day that sounds perfect for you. Get ready together if that’s what you want. Or get ready separately and then do a first look. Whatever sounds the best to you, do THAT. 2. Who should you invite? Well you don’t neeeed to invite anyone, if you don’t want to. Certain states allow you to self-solomize, or you could get your license signed beforehand and have your ceremony alone. But if you DO want to have guests at your elopement, try to keep the guest list as short as possible. Maybe only parents and best friends. Or only 1 witness apiece. Try to think who has been there for you and supported you guys throughout your relationship. Those are going to be the people you want to be there to celebrate your commitment. If you are worried about people getting offended if they aren’t invited, THAT’S NOT YOUR PROBLEM! There’s a reason, you’re eloping, guys! This isn’t FOR them or ABOUT them. This is for YOU and about YOU. Okay, this is the part that is super dependent on the location that you pick. If you’re going to be leaving the country, you’re going to need to research what documents you’re going to need. You don’t want to be stuck on the other side of the world without the proper documentation or any clue where to get it! Something a lot of my overseas clients will do is obtain their license and get it signed BEFORE they leave and then not have to worry about it on their trip! Take note of the weather, rules of the location, and cultural differences that there will be. There’s SO many places in the world that are absolutely beautiful and would be a great place to elope! You can choose somewhere that is meaningful to the two of you, or you can pick a place that you guys have never been to and have a whole new adventure. Put a lot of thought into your ceremony location, and it will be a more meaningful experience. You can totally just go to the courthouse if that seems like what you both want, BUT there’s so many locations to choose from so don’t go with the courthouse option so quickly before you consider all of the options. As an outdoor person myself, I couldn’t see myself ever getting married indoors, but if I wasn’t informed of all of the option, I can see how easy it can be to think that couples have to elope in the courthouse. Also take into consideration the time of year that you guys want to elope at. Do you want there to be snow? Do you want to go hiking on a trail that will be closed in the winter? Take your time and pick the location and time of year that speaks to both of you! 5. Hire a Photographer and videographer! Guys, you’re planning this adventure of a lifetime (marriage), and this is the day it starts (officially). Even if you’re not a “picture-person”, you’re going to want these pictures. You’re going to want these memories. You’re planning this day, full of intention and meaning, and I want you to be able to remember it FOREVER. I want you to be focused on having an amazing adventure with your new spouse, and I want that adventure to CAPTURED for you. I want these photos to be what you look at when you’re having a bad day. I want you to be able to always remember the joy and the love that you guys had on that day, and I don’t want you to ever regret NOT having it captured. You’re not going to have a ton of other expenses, so really invest in your memories by hiring someone to capture them. Whatever you decide to do, just make sure that you are doing it for you and that this day will be a true reflection of your relationship! And if you’re looking for a photographer, (hey!) I’d love to be your cheerleader and preserve some memories for you! Also, if you have any tips for anyone else planning to elope, leave ‘em in the comments below! Click here to fid out how to tell your friends and family that you eloped! Wanna plan a hiking elopement? click here!